Recorded data will be used to help understand the effect of stream temperatures on the spawning success and survival of salmon juveniles. The River Wye has a historic reputation as England and Wales leading salmon river, with a particular emphasis on the size and fecundity of its spring salmon run. The Wye Salmon Association is dedicated to improving the salmon population by bringing together all individuals, associations and representative bodies sharing their skills and knowledge in a common aim. In the Wye catchment, average densities for both fry (hatchling) and parr (young salmon) have fallen in recent years. Parasites, disease and health causes have been ruled out, although other reasons, including a shortfall in numbers of spawning fish and damage arising from very high flows, have not been. Scientific studies indicate salmonid breeding success and juvenile survival are sensitive to high ambient temperatures, with 66% mortality at 12°C compared to 14% at 8°C. It has also been observed that salmon embryos incubated at higher temperatures have a lower body weight. Increasing water temperatures also adversely affect other environmental conditions having potential to cause harm: toxicity of many pollutants is greater at higher temperatures; solubility of oxygen in water falls as temperatures rise and the ability of most species to withstand depleted levels of oxygen is reduced at elevated temperatures. The susceptibility of salmonids to pathogens and parasites may also be influenced by temperature. In September 2017, the Association began a Project to continuously monitor selected streams over a period of four years to gain a better understanding of the effect of in-stream temperatures on spawning success and survival. Tinytag Aquatic 2 data loggers are deployed on the river bed and in the air at 25 sites identified by Natural Resource Wales (NRW) as significant for salmon spawning. The data loggers will record a water temperature reading once an hour during the sampling period. The Association will correlate this with air temperatures, fry and parr numbers and other environmental and biological data and place the results online in an open access database. The aim is that these results will assist NRW and the Environment Agency in developing a comprehensive management plan for salmon. Gemini Data Loggers Aquatic 2 loggers are specifically designed to be anchored securely underwater over long periods. They are compact, accurate and reliable, and have been widely used for varied research into the effects of temperature on aquatic species. 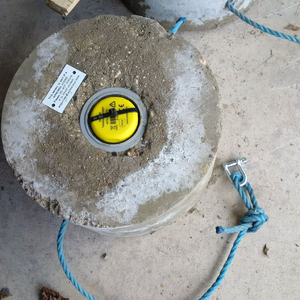 The image shows one of the Association's mounting devices used to fix the data loggers in rivers.